While I was away observing the Jewish Sabbath, news broke that a Muslim Nigerian attempted to bomb a Detroit-bound Northwest Airline (now Delta) flight from Europe, Flight 253. Apparently the liquid and powder bomb he had strapped to his leg blew up and his lap caught on fire . . . which, if you ask me, is poetic justice. New just broke that Umar Farouk Abdulmutallab was charged in a federal criminal complaint for the attempted Islamic terrorist attack. READ THE FEDERAL CRIMINAL COMPLAINT, just publicly filed in Detroit (at the Federal Court for the Eastern District of Michigan) within the last hour or so. I’m glad to see that the Federal Judge presiding over this case is the always wise Judge Paul D. Borman, who–as I’ve reported on this site–takes no BS from Islamic terrorists and their supporters. Also note, though, that the Assistant U.S. Attorneys on this case are Eric M. Straus (known for having a dartboard in his office with the picture of the FBI Detroit’s top terrorism intelligence agent, Paul George, on it) and Jonathan Tukel, who wantonly outed the name of a terrorism confidential informant to the Detroit Free Press and other news sources, in an attempt to get revenge on a rival. The informant was my client, and, as I noted, I believe he’s dead because of the outrageous conduct of Tukel, giving out his name. These two lawyers are total sleazebags, so good luck, America. Abdulmutallab–from a prominent, wealthy, religious Muslim Nigerian family–was recruited to become a jihadist, not in his native Nigeria, but in Great Britain, where he spent three years as a student at University College London. It’s yet another reason why the Visa Waiver program (granting certain designated Western countries an exemption from the usually more stringent visa process to travel to the U.S.) is a huge mistake. We know Muslims come to the U.S. from various assorted Western Visa Waiver countries, and even though Abdulmutallab did not, he was recruited and radicalized in a Visa Waiver Country, Britain, where British nationals are also recruited for Islamic terrorism. Abdulmutallab later went to Yemen, where he was further radicalized. So, ain’t it great, that we are releasing so many Gitmo terrorists there, so they can get trained to do it again, just as he was likely trained there? This incident is also yet another weight on the overwhelming evidence refuting the still often uttered claim that Muslims are driven to terrorism because they are poor or do not have economic and educational opportunities. Not only was he studying in London, but his father, Alhaji Umaru Mutallab, is a wealthy, prominent Nigerian banker, who is the immediate past chairman of the First Bank of Nigeria and a former Nigerian government minister. But as indicated by the “Alhaji” prefix on his fathers name, the elder Mutallab was apparently a religious Muslim, who went on the hajj to Mecca, Saudi Arabia. It also brings into question the policy of banning liquids in excess of 3-ounce containers in a quart bag, since this man–though his attempt failed–was able to get liquid aboard the flight, undetected, and to make explosives. (He boarded in Amsterdam, where presumably there are TSA agents checking flights to the U.S., and if there aren’t, why?) While you and I must throw out a tube of toothpaste that barely contains any toothpaste if the size of the tube exceeds 3 ounces, this guy was able to bring a liquid bomb aboard an American-bound flight. If we simply profiled Muslims, Arabs, and other suspicious people, as the Israelis do, he likely wouldn’t have gotten aboard the flight. Additionally, as I’ve said over and over again, no-fly lists are largely useless, because Islamic terrorists will always recruit someone without a past that would put him/her on the list. This man, Abdulmutallab, was not on the no-fly list. But he was on the terror watch list, which shows you how useless and inaccurate the no-fly list is. Stephanie van Herk, a passenger from the Netherlands who was in seat 18B, said the plane had lowered its landing gear when she heard a loud bang. At first she thought the plane might have blown a tire, she said, but then she saw flames leap from the lap of a man in the row behind her in the window seat 19A. “It was higher than the seat,” said Ms. van Herk, 22 years old. “Then everyone started screaming,” she said. 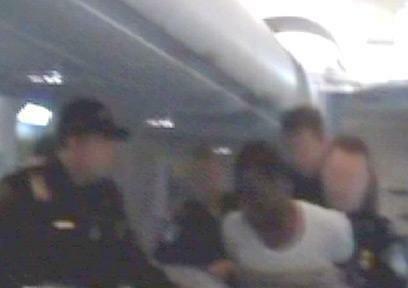 “It was panic.” Flight attendants shouted “What are you doing? What are you doing?” They called for water, and the man began pulling down his burning pants, said Ms. van Herk. She and other passengers got water from the galley and the man was doused. On Saturday, a Dutch passenger who first subdued the terror told CNN that he jumped over several seats and “acted without hesitation” as soon as he saw smoke and fire. Don’t worry, though. American taxpayers are already being soaked for his healthcare needs, which–I assure you–are above and beyond what anyone would get through ObamaCare. His burned crotch and other extremities are being treated at the University of Michigan Medical Center, one of the best hospitals in the world. **** UPDATE: Abdulmutallab’s father Alhaji Umaru Mutallab claims he warned the U.S. Embassy that his son was radicalized and dangerous. Given that, why the heck wasn’t this guy on the no-fly list, and why the heck was he given a two-year visa to come here? Sadly, he isn’t the first and won’t be the last. Like I always say, America is Desperate But NOT Serious in the war against Islamic terrorism. And, hey, aren’t you glad the INS was reorganized and the Department of Homeland Security created to solve this problem? HA. Alhaji Umaru Mutallab, the father of the suspect, warned U.S. officials at the American embassy in Lagos, Nigeria, in recent weeks that he feared his son had been “radicalized” during his trips outside the West African country, according to a senior U.S. official briefed on the exchange. Mr. Mutallab’s concerns about his son weren’t specific nor did they point to any imminent threat against the U.S., according to the official. But the State Department did share the father’s views with officials from the U.S. government’s intelligence and counterterrorism bureaus, according to the official. Mr. Mutallab is a prominent Nigerian banker and a highly respected leader in the nation’s banking and business community. 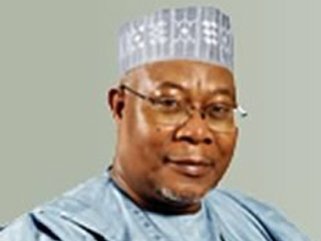 He retired this month from his position as chairman of First Bank of Nigeria PLC after 13 years on the board. The retirement announcement was made on his 70th birthday. Under Mr. Mutallab, the bank expanded to nine subsidiaries in Nigeria and added a bank in the U.K., known as FBN Bank Ltd., as well as a branch in Paris and offices in South Africa and China. He is from Katsina Town, Katsina State, a mostly Muslim state in northern Nigeria, on the border of Niger. According to a report in the Nigerian newspaper This Day Mr. Abudulmutallab attended the British International School in Lome, Togo. Students called him “Alfa,” a local name for an Islamic scholar, the newspaper reported. . . . While in London, it appears that Mr. Abdulmutallab lived in comfort. Public-records database 192.com indicates that an “Umar Mutallab” lived at an address in the upscale Marleybone section of London, in a luxury building on a quiet street. but, all terrorists are Muslims! The Outside World should come and help Nigerian Christians mostly from South as the North Muslim Nigerians are using the Nigeria Army headed by Muslim North Solders to suppress them as they are being killed every day at the slightest provocation. The Muslim North in Nigeria is using the resources from the Christian South to empower their people by putting them at the helm of affairs in Nigeria under the watch of Nigeria Muslim dominated military. Nigeria is not a Muslim country but the Muslim North is using the advantage they have in Government to make Nigeria look like a Muslim Nation. No matter how they try to increase their population by marrying many wives and given birth to so many children, the Christians will subdue them any time any day because our religion is for peace and unity.. No nation can conquer Israel no matter how powerful and Big. In Nigeria, the South Christian dominated part are considered to be in love with any country associated with Israel like the Americans by North Dominated Muslims in Nigeria, therefore, seen to be their enemies irrespective of the fact that they are under one nation courtesy of the OIL from the Southern part. The Muslim North is drawing Nigeria close to Arab world if not why should a Nigeria president from Muslim North travel to Saudi Arabia for medical treatment for more than three months thereby investing in Saudi economy at the detriment of other Nigerians. If the West [Europeans] allow themselves to be used by Muslims to cause harm to God Loving and Peace nations like America and the rest, God will never be happy with them so therefore they should be wary of their Muslim increasing population and Muslims from other part of the World who finds it conducive to plan evil act in European soil against nations considered to be Christian nations that advocates for Peace for all. Daddy Mutallab is really no dnrfefeit from the son, since daddy is into Jihad, too, only that it is money Jihad in the guise of Islamic banking instead of physical Jihad. I would worry more about Daddy Mutallab’s soft Jihad than junior’s failed attempt at going down in a blaze of Islamic glory.